What if you found your own grave—and it wasn’t empty? Discover the dark delights of faeries and fortune-tellers in this gently spooky book from the author of Flights and Chimes and Mysterious Times, sure to appeal to fans of Coraline. Grave robbing is a messy business. A bad business. And for Thomas Marsden, on what was previously an unremarkable spring night in London, it becomes a very spooky business. For lying in an unmarked grave and half covered with dirt is a boy the spitting image of Thomas himself. This is only the first clue that something very strange is happening. Others follow, but it is a fortune-teller’s frightened screams that lead Thomas into a strange world of spiritualists, death, and faery folk. Faery folk with whom Thomas’s life is bizarrely linked. Faery folk who need his help. 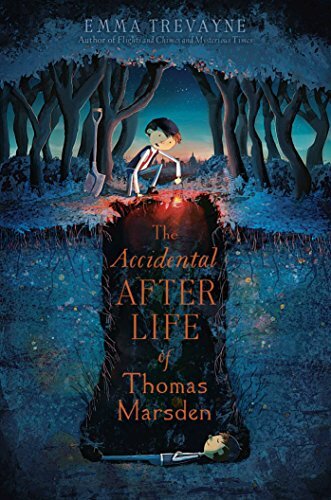 Desperate to unearth the truth about himself and where he comes from, Thomas is about to discover magic, ritual, and the uncanny truth that sometimes the things that make a boy ordinary are what make him extraordinary.